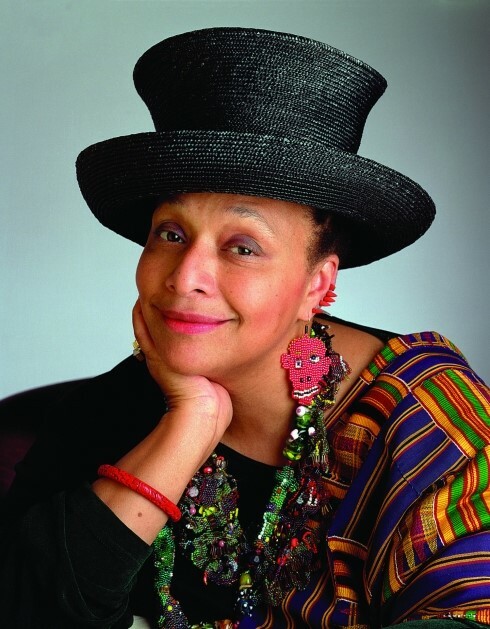 A special ticketed event hosted by the Smithsonian Women's Committee titled “CONVO with the Visionary” will take place at the 2019 Smithsonian Craft Show on Thursday, April 25th, from 6:00pm – 7:00 pm when 2019 Visionary Artist Joyce J. Scott engages in lively conversation with Stephanie Stebich, the Margaret and Terry Stent Director of the Smithsonian American Art Museum, followed by a Q&A. The CONVO promises to be educational, provocative, highly entertaining and the audience should perhaps be prepared to expect the unexpected. Joyce J. Scott has been named the 2019 Smithsonian Visionary Award for her extraordinary work in jewelry. Scott’s gorgeous creations in beads and glass wed visual beauty, and often humor, with provocative statements on race, violence, and sexism. Her art celebrates a family history of craftsmanship and most particularly her mother Elizabeth Talford Scott, a nationally heralded fiber artist, who taught Joyce to sew with beads when she was 5 years old. Born, raised and still living in Baltimore, Scott was named a MacArthur Fellow in 2016. Her work appears in major museums nationwide, including the Smithsonian American Art Museum and the Metropolitan Museum of Art. Selected pieces will be on exhibit during the Craft Show at the National Building Museum. Stephanie Stebich is the Margaret and Terry Stent Director of the Smithsonian American Art Museum (SAAM). Together with the Renwick Gallery, its branch museum devoted to contemporary craft, SAAM is home to one of the largest and most inclusive collections of American art in the world. Following a recent major renovation of the Renwick Gallery’s historic building, the museum has pointed to new directions in the field of craft with exhibitions and programs that showcase the work of artists exploring traditional and innovative approaches to making. The 2018 exhibition No Spectators: The Art of Burning Man attracted 766,000 visitors, more than doubling annual attendance at the Renwick Gallery.